Veins of the brain are thin-walled due to absence of muscles in the walls. These veins are devoid of valves, so blood does not have unidirectional flow. Arrangement of veins does not follow the arterial pattern. 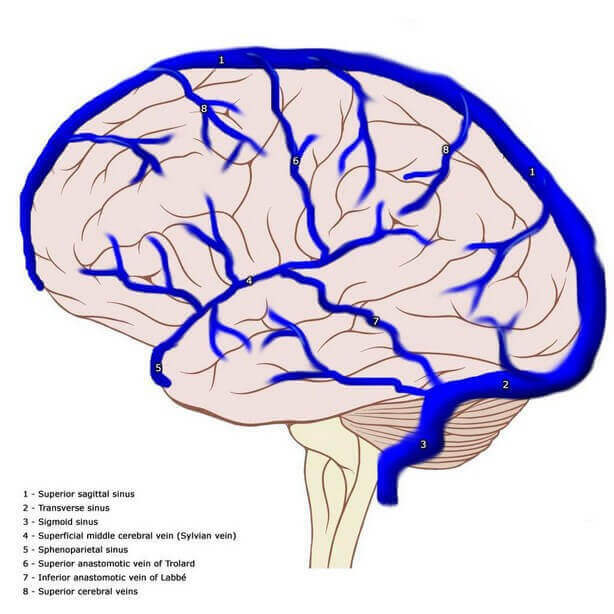 All the veins of brain ultimately drain in intracranial venous sinus. Veins are situated initially in subarachnoid space. But ultimately they pierce arachnoid mater and meningeal layer of dura mater to drain into venous sinuses. To maintain the patency, some of the veins drains against the direction of blood flow through the sinus. These veins are 6–12 in number. They are shorter in length and parallel to each other. Superior cerebral veins drain the upper halves of both superolateral as well as medial surfaces of cerebrum. They drain in superior sagittal sinus. Anterior group opens at right angle but posterior group of veins opens obliquely against the direction of blood flow (anterior to posterior) in superior sagittal sinus. This will maintain their patency even when CSF pressure is increased. It runs downwards, forwards and medially along the length of posterior ramus and then stem of lateral sulcus of brain. This vein will receive tributaries from the area of superolateral surface around posterior ramus of lateral sulcus. Superficial middle cerebral vein drains into cavernous sinus or sometimes into sphenoparietal sinus. It is situated very deep in lateral sulcus on the surface of insular cortex and coupled with middle cerebral artery. It runs downwards and forwards to form basal vein joining with anterior cerebral vein. It is the only vein which is the companion of corresponding artery, i.e. anterior cerebral artery. It runs over the surface of corpus callosum and approaches towards base of the brain curving genu. It receives small tributaries from the area of medial surface of cerebral hemisphere which is not drained by superior and inferior sagittal sinuses. As mentioned earlier, anterior cerebral vein forms basal vein joining with deep middle cerebral vein. These are multiple small veins draining inferior surface of cerebral hemisphere. They are divided into two groups. Veins draining orbital surface converge and terminate into superior cerebral veins or directly into superior sagittal sinus. Veins of tentorial surface drain into cavernous sinus. There are two internal cerebral veins, one on either side of midline. Internal cerebral vein begins at the level of interventricular foramen of Monro at the apex of tela choroidea of third ventricle. This vein is formed by union of following veins. Thalamostriate vein: Drains thalamus and basal ganglion (corpus striatum). Septal vein: Drains septum pellucidum. Choroidal vein: Drains from choroid plexus. The two internal cerebral veins, one on either side of midline, run backwards between two layers of tela choroidea. Below splenium of corpus callosum two veins join to form great cerebral vein of Gelen.